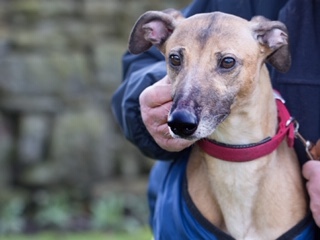 Lola is a 6 year old female Lurcher. She loves her humans and likes company. In fact, Lola would like someone around with her for most of the time. She doesn’t really like being left for long periods of time. Lola walks well on the lead and sits on command. She would suit a home with no cats and slightly older children. All she wants is a lovely quiet life. Lola could possibly live with another friendly dog. Like most of her breed, Lola loves nothing more than curling up for a snooze.